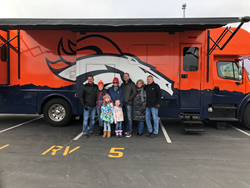 The Ultimate Broncos RV Tailgating Sweepstakes winner, Josh Myers, and his guests. 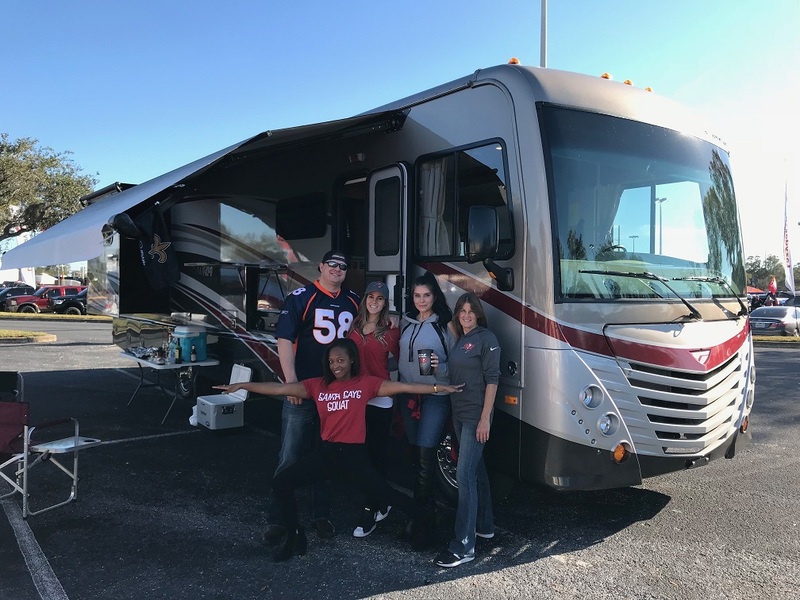 We are proud to partner with the Tampa Bay Buccaneers, Denver Broncos and Florida Gators, and to enhance fans’ game-day excitement with dedicated RV Tailgating Lots and activities. Lazydays, The RV Authority and world’s largest dealership, recently sponsored its second Ultimate RV Tailgating Experience Sweepstakes in partnership with the Tampa Bay Buccaneers, Denver Broncos and Florida Gators, and is pleased to announce the three lucky football fans who were awarded the prize packages. 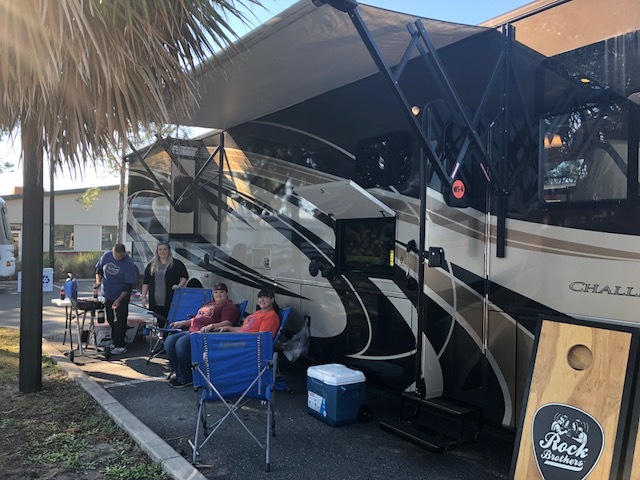 Each prize package included pre-game use of a motorhome in the Lazydays RV Tailgating Lot, four game tickets, tailgating fun and games, team memorabilia signed by a current or veteran player, a $500 gift card to the Lazydays RV Accessories and More Store and other special perks. The three winners were: Stephanie Ladmirault of Tampa, Fla., Ultimate Buccaneers RV Tailgating; Josh Myers of Denver, Colo., Ultimate Broncos RV Tailgating; Lindsay Handley of Jacksonville, Fla., Ultimate Gators RV Tailgating. Explore the world’s largest selection of RV brands and RV accessories or book RV rentals in Florida, Colorado or Arizona at https://www.lazydays.com/. For details on future events and contests, follow Lazydays RV on Facebook and Twitter. Lazydays, The RV Authority, is an iconic brand in the RV industry. Home of the world’s largest recreational dealership, based on 126 acres outside of Tampa, Florida, Lazydays RV also has dealerships located in Tucson, Arizona, and Loveland, Denver and Longmont, Colorado. Offering the nation’s largest selection of leading RV brands, Lazydays RV features more than 2,500 new and pre-owned RVs, over 300 service bays and two on-site campgrounds with over 700 RV campsites. Lazydays also has rental fleets in Florida, Arizona and Colorado. In addition, Lazydays RV Accessories & More stores offer thousands of accessories and hard-to-find parts at all of our dealership locations. To learn more, visit http://www.lazydays.com. The Ultimate Buccaneers RV Tailgating Sweepstakes winner, Stephanie Ladmirault, and her guests. The Ultimate Gators RV Tailgating Sweepstakes winner, Lindsay Handley, and her guests.